Subaru in LondonThe Japanese entered Subaru 4WD sets out from London on day one of the 77 London-Sydney Rally. This was thought to be Subaru's first ever entry on an international rally. Motoring News 11th August 1977Motoring News covers the rally start. There is also an article looking at the preparation of Tony Fowkes Mercedes. 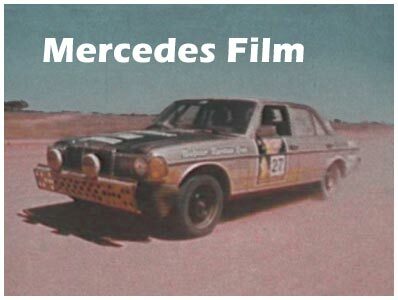 Mercedes publicity filmThis film was made by Mercedes for advertising and publicity. Un-surprisingly it exclusively features the Mercedes cars. It's perhaps fortunate that they were better at rallying than film making. The rally leaves AdelaideA typical newspaper article about the rally as it leaves Adelaide on the way to Melbourne. Motoring News 18th August 1977A Gerry Phillips 'Verglas' written article covering the start of the 1977 London-Sydney rally. Motoring News 25th August 1977 - page 1 of 2A comprehensive Motoring News report on the rally as far as Tehran. This is the first of two pages. The Regulations - Page 24Not much on this page..... just the rally logo and strap line.